Dongguk BUD (DUBUD), which is managed by the Department of International Affairs, consists of “DU,” from Dongguk University, and “BUD,” from the English word buddy. It sounds like “The friend of Dongguk University,” because the word “BUD” means a close friend in Korean. DUBUD is a program that matches a Korean student with an international exchange student, making a pair of mentor and mentee. It started six years ago, and in 2014, it made 89 pairs. DUBUD is also a meaningful activity in both language exchange and volunteering work aspects. The Dongguk Post had interviews with Korean participant who is a mentor of Japanese exchange student, and an exchange student who got some help from DUBUD last semester. Park Da-seul, who is a junior majoring in Chemical and Biochemical Engineering, is now participating in DUBUD as a buddy for Japanese exchange student. However, she has never studied Japanese in institutions. Her major also has no relations to Japan. She was just curious about Japanese language and culture. Thus, she studied Japanese through TV programs. Meanwhile, she participated in Dongguk Mentoring School, which offers an opportunity to learn languages from exchange students. During the program, she noticed the presence of DUBUD, and decided to join as a buddy. Her mentee, Hasebe Moe, a student from Gakushuin University, visited Dongguk University as a student of Dongguk Japanese Summer School. She experienced various Korean cultures including watching NANTA performance, wearing traditional clothes, and touring Geongbokgung palace. She really enjoyed it and decided to visit here again as an exchange student. Unfortunately, Dongguk was not a place that fits for Japanese students who cannot speak either Korean or English. Using Japanese, Hasebe could not solve problems, occurring in daily life to school studies. Park tried to help Hasebe from banking to course registration or dormitory application to relive her mate’s anxiety. For example, she offered the fundamental things that are recommended in DUBUD official orientation book. They were pick-up from the airport, pillow and blanket purchase, and certificate of alien registration. Surprisingly, these things were just the tip of an iceberg. They did things beyond the borders of official programs. Visiting mini pub of the Department of Japanese Language and Literature during school festival, sleeping together in Korean dry sauna, watching movies in Daehan Theater, and touring Changdeokgung palace were experiences that Park offered to Hasebe. Park finally thought that they are no more formal DUBUD mentor and mentee, but rather true friends. Through participating in DUBUD program, Park learned many things. First was her improved language skill. We often use the phrase ‘Globalization.’ However, it is hard to upgrade someone’s language ability without the effort to find the opportunities outside of the school, for example language-study-abroad, private institute, or exchange student. Instead of these, Park chose DUBUD as a way to exchange Korean to Japanese with her mate, and actually it helped a lot. In addition, even Park herself learned more about Korean cultures since she had to study to explain detailed things about Korean culture. When she and Hasebe visited Bukchon Hanok Village, she had difficulties in explaining the history, background, and the people who had lived there. DUBUD program was a chance to learn more about her cultures. 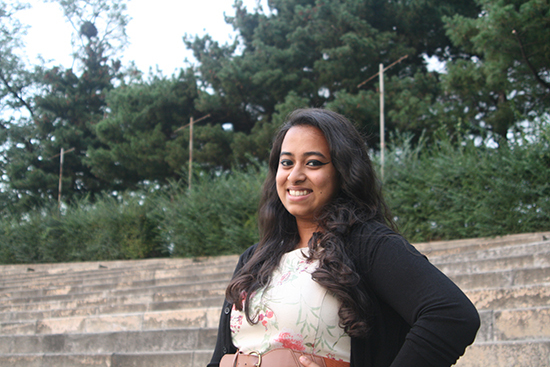 Ramya Ramachanderan is a junior from India, majoring in Law and Political Science and Deplomacy. Ramya came to Korea because of her experience at a Model United Nation (MUN) Conference, which is an educational simulation and academic competition. She has been interested in Korean history and society before, and in the MUN Conference, she felt that the world ignores Korea a lot, for instance, the Korean War. She means that the world thinks of the Vietnam War seriously whereas it does not care about Korean separated families. Another reason she came to Korea is that she realized Korea has its unique culture, like Hangul and patriotic people. She also watched Korean dramas, and listened to K-pops because her friends at International School introduced to her. Therefore, she could easily get used to Korean culture, then her Korean teachers recommended her to take an exchange student course. There are several differences in university life styles between Korea and India. One is that Korean university students can choose the lectures they want, whereas Indian university students are forced to take designated lectures. In India, students do not move their classrooms, the professors come to the class, like we did in high school. Ramya thinks Korean style is more efficient when studying because students take lectures that they choose. Another different thing, is that Korean students study too hard. Studying at library, late at night, even staying up all night is not usual in India. She said, “It is good to study hard, it looks scary though.” Finally, there are lots of Korean students who went abroad for studying and travelling. They go to foreign countries not only to have fun, but also to broaden their perspectives toward the world. In India, there are not many people who went and studied abroad. The impression Ramya received from Dongguk is that students are so introverted. Since she came to Seoul, because she wanted to talk with Koreans, she hoped Korean students to be more open to international students. However, most Korean students do not talk to her because she does not look like an American or European. She said she cannot understand the students’ reactions when they find out she can speak American English. She also feels sad when Dongguk students try to be her friends only because she is a foreign student or because she speaks English well. Ramya said she also had a really good time with her friend, and they did many memorable things together. She said the most unforgettable moment was when she first went to the Han River, rode a bicycle, and had chicken and beer with her friend. “It is unusual in India, so it was an exciting and refreshing moment,” she said. Also when she was invited by her Korean exchange student’s family and stayed at their place for a week, she really appreciated them and had a comfortable time. The size of the apartment was shocking to her because having an apartment that big in India costs a lot. She said she does not recall any bad memories, not only because she easily forgets bad memories, but also because most of her friends made her a happy time to stay here at Dongguk.